In a large nonstick skillet, melt coconut oil over high heat. Toss in chicken cubes, cooking until golden brown on the edges and cooked through. Set aside. In skillet, bring honey to a boil over medium-high heat. Add sriracha and cooked chicken. Cook over medium heat, stirring constantly, until the glaze begins to thicken, about 7-12 minutes. Serve over warmed quinoa, topped with chopped scallions and cilantro. Quinoa is the mildly nutty, easy-to-prepare super food you need in your life. Known as "the mother grain," quinoa is technically not a grain at all but rather a tiny, tough, little seed. Grain or seed, in our humble opinion, anything that rice can do, quinoa can do better. One of these can-do capabilities is that the ultra-absorbent texture makes it the perfect base for a variety of dishes. Exhibit A: this honey-sriracha chicken. 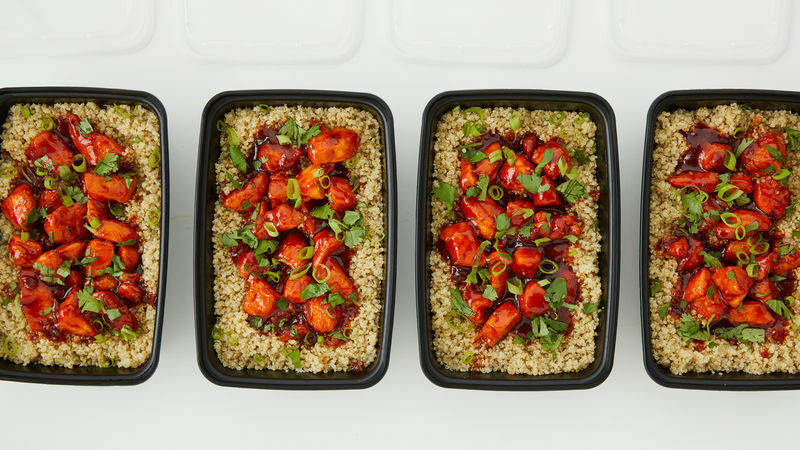 Sweet honey, spicy sriracha, tender chicken and fluffy quinoa—where do we sign up? This chicken-filled quinoa bowl meets all of our requirements for a fast and flavorful weeknight meal you don’t have to feel guilty about. Once you start adding swapping in quinoa, you won’t be able to stop. Lucky for you, we have plenty of quinoa dishes to inspire you.